When I was eighteen I rented a basement flat in Dublin. I lived beneath a red brick terrace house on the banks of the Grand Canal. I had my own entrance down some steep steps from the road, and the run of the whole basement floor where once young maids and a cook lived in their own cosy world. My bedroom was fine if a bit dark; perhaps the old servants’ hall, and other gloomy rooms that were locked away to me, but a bathroom and a kitchen with a gas cooker down a long hall past cobwebs that had died years before. My landlady was very old. She lived upstairs somewhere and I had never met her. She had a son who also lived in the vast house above me and he collected the rent every week which was five pounds; a fortune for me as a student. When I moved into my flat it was bare apart from an old and very rickety bed and a small table. So I collected my bits and pieces from all over Ireland; stored in attics in friends’ homes, and made a little nest for my young self. At that time I had a collection of ancient swords and guns and fishing rods from our old home in County Kildare which my mad father in his wisdom had sold with little advance notice, and an eighty year-old Bengal tiger skin that I had also rescued before the house was sold. He had eaten eight unfortunate Indians before getting shot by an ancestor during the Raj, and I’ve still got one of his front teeth – it is my lucky charm. Proud to have been accepted by the King’s Inns as a future Barrister I had to complete my Trinity College Dublin entrance exams to read law. I studied hard but got lonely over the months, and though the ducks on the canal were sympathetic I really needed to get out and meet a girl. Only two bob left to my name. I thought I must do something about this despite my poverty. So one night I dressed up in my only suit and tie and walked two miles to a dance hall just off O’Connell Street. Her name was Siobhan and she had long red hair and light green eyes that seemed to change their colour all the time – just like the mountains of the Mourne. Soft valleys full of sunlight shone in them and then dark clouds that brought torrential rain. We danced all night until they closed the club. The only facts she told me about herself were her first name and that she was in her last year at a Catholic school in Crumlin. I gave her my phone number; she would not give me hers. Have you ever sat next to the telephone for two days in a row without sleeping, eating or drinking? She was the most beautiful thing I had ever seen in my life. So I waited and I waited and she didn’t call. I was in absolute despair. I got the ‘phone book out and looked up every Catholic girl’s college in the area. There were four of them and I phoned them all, one after another. Asked do you have a student named Siobhan who is seventeen, I’m sorry I don’t know her last name. I explained the reason for my call in detail and I heard giggles in the background but I didn’t care. No luck on the ‘phone so the next day my plan was to visit them all on my motorbike until I found her. I knocked on the Convent doors all over Crumlin and asked do you have a student here named Siobhan? Much to my surprise I got a hit on my second visit. It was the Mother Superior who came to meet me in the reception area. An old nun dressed in white with a wooden crucifix on her chest. “I love her.” I replied. The following Saturday was her eighteenth birthday. I gave her a half-nibbled bar of Cadbury’s chocolate and in return she gave me a blow-job on the grass at St. Stephen’s Green. I think it was the ducks that brought me luck. God help me I hope no-one noticed. 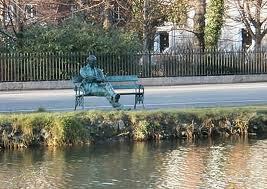 That is I believe Patrick Kavanagh keeping an eye from the far bank of the canal Tim, perhaps an unknown inspiration for your future writing. Great story, I lived in a flat like that too for a while, memories of the National Ballroom on Parnell Square (packed with nurses) and other like places, then on the way home having bangers and mash in an all night greasy spoon just off Harcourt Street (Adelaide Road?) where one night many years ago I had a long chat with Ulick OÇonnor. It was indeed himself from the other bank James. I often sat down with him and had a chat though he didn’t say a lot. It didn’t matter then because we understood each other, and there was no need for idle talk. The ducks were more my friends then. I felt lonely despite having many friends. When I got a job later on I had money to rent a decent flat; it was on Sandymount Strand right on the beach (next to the rail crossing). A place I loved despite the cold and wind that constantly crashed against the house. I went there too then, the Greasy Spoon my friend for tea and buns many times! And I will tell you where there is a Leprechaun. He is an old friend of mine (in Co. Kildare for a hint) but he never shows himself to people who don’t care. For you he will one day . . there are no guarantees; no promises of a pot of gold at the end of the rainbow. There is a rainbow in all of us; we just have to understand it.